Russia is a simply vast country, although you will find many of its most visited attractions not only in Moscow, but within its spreading Central Federal District. Make sure that you plan ahead, to leave time for day trips to the attractions within surrounding cities, towns and villages close to Moscow, such as Klin, Istra and Zavidovo. The much-visited village of Borodino, some 130 km / 81 miles to the west of Moscow, is really famous for one thing only, being the location where Napoleon chose to invade Russia in 1812. Also close by is the city of Tver, which during the 14th and 15th centuries was one of Russia's most important cities and regularly visited by the Russian monarchy of the day, when it was known as Kalinin. This tragic single-day battle was deemed to be a victory by the French, although both sides lost considerable numbers, with a total of over 100,000 soldiers lost in the Battle of Borodino. Today, the main attractions in the city are based within the Borodino Field Museum Preserve, which encompasses the entire battlefield and covers a vast area of roughly 100 square kilometres / 39 square miles. 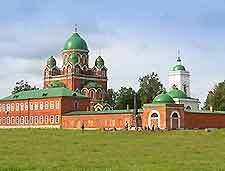 An appealing town located within the region known as the Moscow Oblast, Klin lies some 90 km / 56 miles to the north-west of the city and is where Tchaikovsky would spend many of his summer holidays composing. 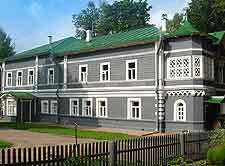 His estate can be found on the outskirts of Klin and after his death in 1893, was preserved and became the Tchaikovsky House Museum. 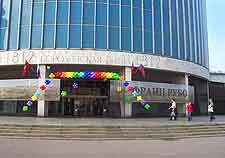 From time to time, a number of musical events are hosted within the concert hall, where accomplished pianists actually play on Tchaikovsky's priceless grand piano. Throughout the year, the town of Istra experiences a steady stream of visiting pilgrims, who arrive to worship at the famed New Jerusalem Monastery (Voskresensky Monastery), which was established in the mid-17th century and sits on the banks of the Istra River. Next to the monastery, the Museum of Wooden Architecture features a rather surprising collection of riverside windmills and cottages. With a population rapidly approaching half a million and a popular excursion from Moscow, the city of Tver lies around 150 km / 93 miles to the north-west and boasts a rich heritage. Today, the city is where you will find the highly acclaimed Tver State University, along with Catherine the Great's glorious Road Palace, which was completed in 1775 and stands on one side of the Sovetskaya Ulitsa. The Prioksko Terrasny Reserve encompasses an area of some 50 square kilometres / 19 square miles and can be found on the northerly flood plain of the Oka River. Each year many tourists visit the Prioksko Terrasny Reserve from Moscow, to experience the reserve's rich variety of Russian flora and fauna, which even includes a rare herd of European bison that was brought back from the very brink of extinction in the middle of the 20th century. Zavidovo is an especially scenic spot and stands at the meeting point of both the Shosha River and the Volga River. The suburbs of this charming village are home to the ever-popular Zavidovo Holiday Complex, which boasts an array of recreational attractions for all ages. These include horse riding, tennis, sailing and even water-skiing.